Truly lovely. Excellent applique work and extraordinarily straight and uniform stitching. 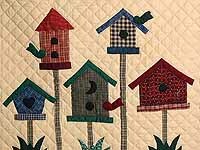 Note the beautiful print fabrics used for the applique. Made here in Lancaster by an Amish woman. 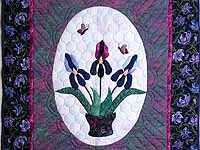 In your garden Iris are in bloom for only a few weeks, but this wonderful bouquet will stay in bloom in your home all year! Very well made, with fantastic fabrics and fine applique work. Includes a sleeve for a hanging rod. Made in Lancaster by an Amish woman. Brilliant! Super fabric selection. 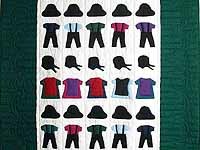 This design looks simple but is very difficult to properly piece (we have seen many with crooked stripes) -- the Amish lady that pieced this wall hanging got it right! Includes hanging tabs. 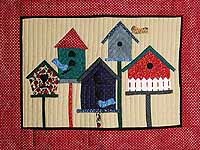 Gorgeous large wall hanging/throw by Cheryl Benner. 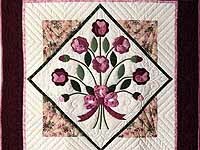 Excellent applique work with beautiful fabrics. Note the fantastic corner treatment! Made by Lancaster Amish woman. Includes a sleeve for a hanging rod. 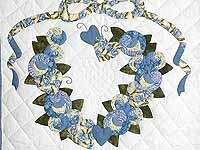 A lovely rendition of Cheryl Benners Vines and Roses design in soft cool blues and yellows. 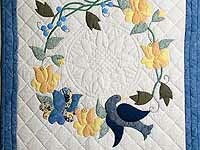 Well made with lots of fine quilting and excellent applique work. Made in Lancaster by an Amish woman. Signed by the designer. Includes tabs for a hanging rod. 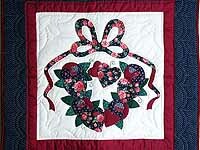 A charming appliqued quilted wall hanging with the popular Country Bride pattern. Note the lovely fabrics selected for the applique work. Well made by local Amish woman. Includes a sleeve for a hanging rod. 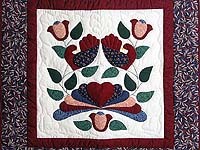 Superior applique work and lovely fabrics. 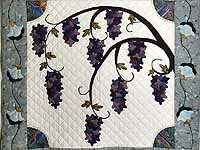 The raspberry tones give this wall hanging a distinctive very attractive look. Made in Lancaster by an Amish woman. Includes a sleeve for a hanging rod.